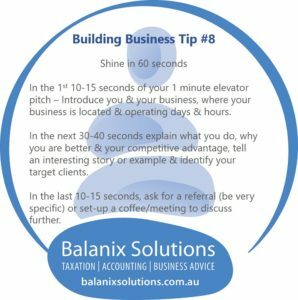 In the 1st 10-15 seconds of your 1 minute elevator pitch – Introduce you & your business, where your business is located & operating days & hours. In the next 30-40 seconds explain what you do, why you are better & your competitive advantage, tell an interesting story or example & identify your target clients. In the last 10-15 seconds, ask for a referral (be very specific) or set-up a coffee/meeting to discuss further.